The recipe for Quinoa and Kale Patties comes from Heidi Swanson’s cookbook Super Natural Every Day. The price of the book has recently been lowered to $13.00. Although not vegan, Heidi does cook very healthy recipes with natural ingredients. This recipe was very tasty and simple to make it vegan by substituting the eggs, and using nutritional yeast rather than the cheese. The quinoa is high in protien, and the kale is still available fresh in the stores. There is only 1 teaspoon of oil in the recipe that makes 8 lovely big patties. We baked them rather than frying, so it was a light but filling meal. 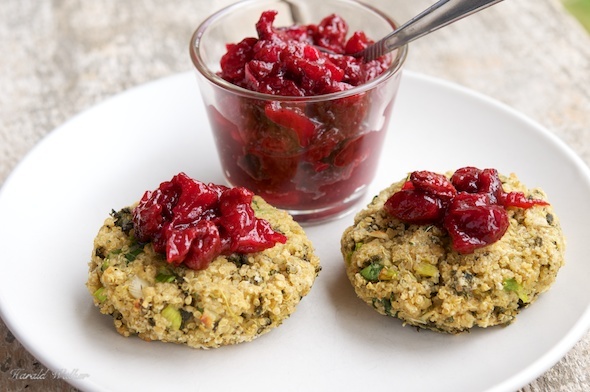 We enjoyed the patties with homemade cranberry chutney. Any chutney would be nice with these tasty patties. Posted by Chris Walker on April 28, 2013 in Kale, Quinoa, Reviews.